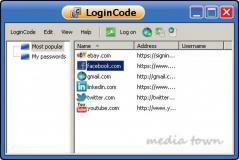 LoginCode is a small application that enables you to securely store your passwords in an encrypted database that makes it possible to automatically log into websites. The database is encrypted using the AES-256 bit algorithm and creating it is extremely easy thanks to the wizard-based assistant. Users have the option to password-protect the database so unauthorized third-parties cannot access it. Also, it’s possible to select the saving folder, hashing and encryption algorithms as well as the items that should be included. LoginCode enables you to import passwords from popular web browsers such as Chrome, Internet Exploter, Safari, Firefox and Opera. Furthermore, you can copy passwords to the clipboard and export the database as a CSV file.